Learn about edible insects, their health benefits, and how to add to your recipes. Today, the biggest bug markets are found in Asia, Australia, and Peru, where over 1,900 insect species are part of traditional diets. Gradually crawling their way across Europe and into the Western Hemisphere, edible insects are now showing up in American and Canadian specialty food products, in recipes, and yes – even on restaurant menus. The most common varieties are crickets, beetles, caterpillars, grasshoppers, bees, wasps, ants, a variety of worms and scale insects, but don’t rule out dragonflies, termites, locusts, and scorpions creeping into lists of food ingredients either. If your stomach is doing somersaults, if you are squirming in your seat, or if your skin is starting to feel uncomfortably creepy-crawly, you are not alone! In fact, according to the experts, the “yuck” or “ew” factor is the biggest hurdle when it comes to market acceptance by Western consumers, where insect products have no tradition in diet. At the same time, they are quick to point out that not long ago, eating sushi in the U.S. was unheard of, or thought of as disgusting. Yet today sushi joins a growing list of other once-frowned-upon, rejected foods that are now considered mainstream and even meriting fine-dining status. These include kimchi, sashimi, and quinoa, one of today’s most trending protein-packed ancient grains. Moreover – and this is important news for food establishment owners and managers – the demographic already attracted to and most likely to embrace edible insects are millennials – today’s largest dining-out population. For example, in 2016, 25-year-old Kelly Struek dropped out of the University of Nebraska in his senior year to become co-founder and CEO of Bugeater with two classmates. 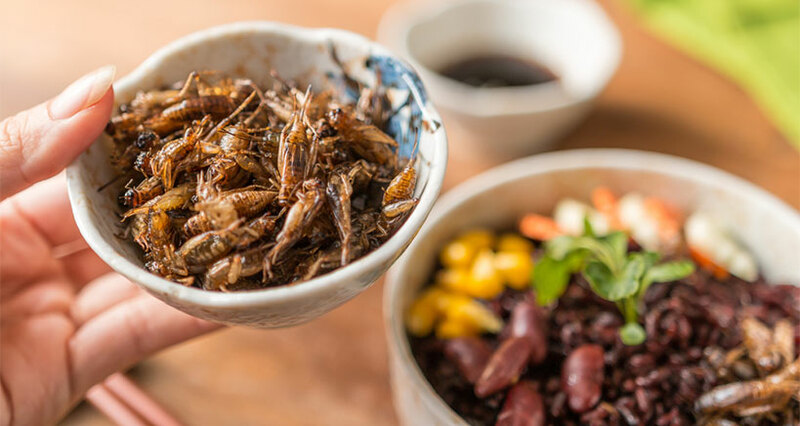 Inspired by their own quest for better and more sustainable sources of protein than beef, they found that crickets fit the bill. So, in addition to their signature cricket protein shake called Jump, they began using cricket powder and Entomo crickets as a base for making pastas, noodles, and rice. Adding some stats to the table, according to Innova Market Insights, which studies food trends concerning new products, millennial-driven start-ups and investors embracing bugs are on the rise. Moreover, they place insects and insect protein near the top of the list of meat alternatives expected to soar in the year ahead. Gourmet hotel chefs associated with Benchmark, a global resort and conference center management group, also peg insects as one of their leading trends, while a host of other experts such as Kara Nielsen, vice president of trends and marketing at CCD Innovation, and Cheryl Preyer, secretary of the board of the North American Coalition for Insect Agriculture (NACIA), expect eating insects to become increasingly more acceptable to the North American psyche and palate. However, while insects are joining other forms of protein providing alternatives to meat, including plant and grain-based options, the question is: Will Americans actually eat them? Before taking an in-depth look at WHY you should consider adding insect-based ingredients to your recipes, and more importantly, HOW to incorporate bugs into your dishes and restaurant menus, the short answer, according to the latest research reports by Global Market Insights, is a resounding YES! Check out the following Global Newswire headlines: Edible Insects Market will register phenomenal growth of 43.5% to beat $710 million by 2024. The report adds that the newcomers will manifest primarily in the form of insect-based flours, protein bars, and snacks, while this current food trend is being driven by increasing consumer awareness of the health benefits of insects, including being protein-rich, playing a vital role in the ecosystem, minimizing cardiovascular diseases risks, and more. In addition, the FDA has confirmed that consumer consumption of crickets and mealworms as natural protein sources is safe, and growing product demand is bolstering the likelihood that more critters will soon earn the status of approved natural food products. So, why eat bugs? Well, according to health professionals, not only are they loaded with protein, fiber, vitamins and minerals, they also outshine most fruits and vegetables in these areas, rivaling the nutrient value of some of the healthiest grains. In addition, they cause only a fraction of the greenhouse gas emissions and health concerns associated with cattle and beef, contain more calcium than milk, more iron than spinach, appeal to gluten-free and paleo eaters, are low in saturated fat, and are high in prebiotic fiber, which is good for your gut. 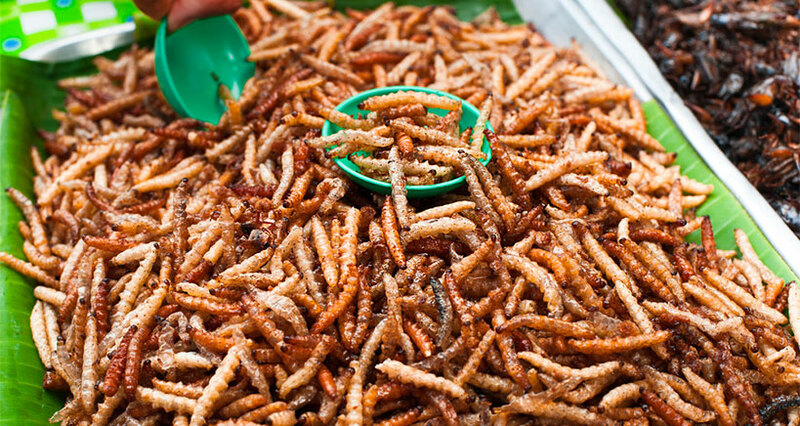 For these and more reasons, edible insects are being hailed as the next superfood. According to industry execs, the legitimacy insects have earned, and their rising popularity, are part-and-parcel of the broader consumer movement towards healthy, eco-conscious foods. Add to this the nutritional benefits and the low environmental stress of insects, and what you have is a winning recipe for increasing research and development in the field, regulatory support, and what bug-eating-enthusiasts hope for most: positive media coverage and increased availability of insect products. Here is a more detailed breakdown – and the lowdown – on the properties and benefits of some types of edible insects and how chefs and restaurants are featuring them in their menus. By far the most accepted to date in the Western world, crickets are consumed in the form of cricket protein, powder and flour, in addition to eating the bugs themselves. Nutritionally, they contain high levels of protein and fiber, are rich in calcium and Vitamin B12, help reduce inflammation, and are gut-healthy. But cricket protein is their biggest claim to fame, as it is a complete protein containing all nine essential amino acids. And, in case you were wondering, those who already cook and bake with crickets describe their taste as neutral with a slightly nutty flavor. Scale insects primarily play an auxiliary role in the culinary world. For example, in some countries they help increase honey production, while their red dye, carmine, is used in food coloring. Easy to harvest, caterpillars are a rich source of protein, minerals and vitamins. In particular, the Mopane caterpillar is comprised of 61% protein and helps combat dietary iron deficiency. Known to eat tree leaves, they also have a positive impact on forest ecosystems. Rich in protein, low in cholesterol, non-toxic, and eco-friendly, the edible insect market for grasshoppers, locusts, and beetles is already strong in many parts of the world and projected to grow. In Asia, for example, these bugs are accepted as dietary food supplements and are widely used in the preparation of breads, biscuits, desserts, and smoothies. Adult bees are typically roasted and ground to produce a nutritious flour. In China, ground bees are used medicinally, especially to cure sore throats. 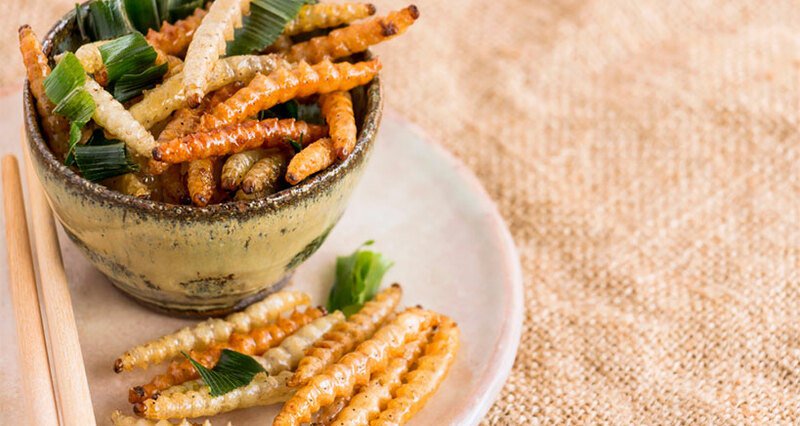 If the concept of edible insects is growing on you, here are some ideas as to how your foodservice can begin adding bugs to your menus and recipes. According to EdibleInsects.com President Bill Broadbent, his largest bug-eating customers are vegetarians, bodybuilders, people hungry for new cultural taste experiences, and diet-conscious consumers. His favorite picks are black ants, mealworms, and Manchurian scorpions: “Black ants are used to replace lemon and lime in many recipes because they have a strong citrus taste, a nice crunch, and their black color looks great. Plus, they are small enough to not really look like insects.” As for Manchurian scorpions: “First, they are scorpions, so they look cool. But they also glow in the dark under a black light and everyone loves to see that.” And when it comes to mealworms, one chef describes them as taking on any flavor you cook with. She fries them, sautés them, and even uses them to make mealworm Rice Krispies treats. Did you know that the University of Florida now offers courses such as Etymology 101: Bugs and People? It features insect-cooking demonstrations showing how easy it is to incorporate bugs into everyday diets. If you want to learn more about cooking with grasshoppers, take a trip to Mexico or visit your local Mexican eating establishments where consuming chapulines is a longstanding tradition. You might find them dressed in lime, garlic, chili and salt, dropped into tacos, or perched proudly on the foam of cocktails. Finally, James Ricci, Co-Founder and Chief Technology Officer at Ovipost, freezes crickets, removes their legs, rinses and pats them dry, tosses them in a honey vinegar sauce, and fries them in serrano-infused olive oil for 3-5 minutes. The crickets are then spread on a baking sheet, coated with light honey, and baked for 15-20 minutes. He recommends serving them as finger foods or with coleslaw. If you are not in love with bugs yet but are interested in experimenting with edible insects and introducing them to your customers, the experts all agree that that best way to start is by incorporating cricket flour, cricket powder, or cricket protein into your recipes. Here is one such recipe to get you started. 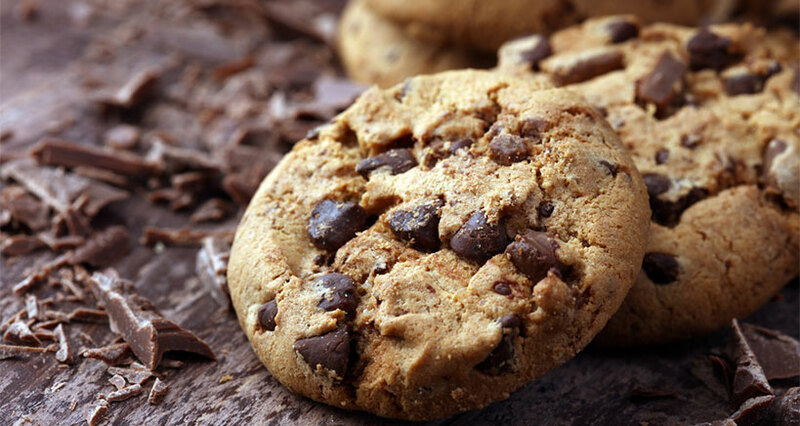 Note: For the uninitiated, the dry-roasted crickets are optional; you can continue to use conventional chocolate chips while you enjoy baking with cricket flour for the first time. Next Next post: Ramp Up Your 2019 Beverage Menu With These New And Exciting Beverages.